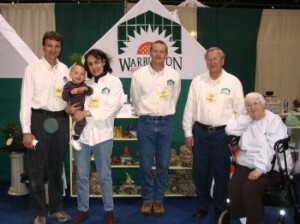 In 1985, Ed founded Warburton Greenhouses in Elizabethtown, Pennsylvania and has been growing plants locally ever since. With nearly 37,000 square feet of growing space, Warburton Greenhouses produces more than 80,000 annual and perennial plants each year. In the springtime, the greenhouses are filled with 3,000 hanging baskets, 10,000 four-packs ready to be planted, and hundreds of mixed containers and other specialty items such as bonsai, topiaries, water plants, herbs, vegetables, and hanging pouches. Throughout the year, more than 5,000 trees and shrubs are available from the Greenhouses’ nursery. Growing plants has been a passion for Ed Warburton for over 50 years. His interest in plants as a teenager culminated in a horticulture degree from the Alfred Agricultural and Technical Institute in 1959. A long-time growing career at Longwood Gardens in Kennett Square, Pennsylvania and directing the Propagation Department at the New York Botanical Gardens expanded Ed’s expertise in growing unique varieties of plants from all parts of the world. In 1985, Ed founded Warburton Greenhouses in Elizabethtown, Pennsylvania and has been growing plants locally ever since. Ruth, Ed’s wife of 42 years, has been an invaluable member of the greenhouse operations by taking care of the business’ paperwork. Ed and Ruth’s sons, John and Paul, inherited the family knack for growing plants. John studied Ornamental Horticulture at Penn State University and has an impressive knowledge of the botanical and common names of plants as well as the details of the conditions they need to grow. Paul graduated from Penn State with a degree in Floriculture and a minor in Business and enjoys creating new and unique products each year. Paul’s wife Brenda recently joined the family business and enjoys helping wherever needed. Customer service is important at Warburton Greenhouses. Each customer has a different level of plant knowledge and different needs. The Warburtons strive to meet the individual requests of all their customers in specialized ways – whether it is providing advice on creating the perfect mixed container or planting the right combination of trees and shrubs to round out a landscape design. The retail location of Warburton Greenhouses on Route 743 is closed November through February, but the business is not taking a break! These are critical months for growing the spring blossoms at the Bellaire facility.